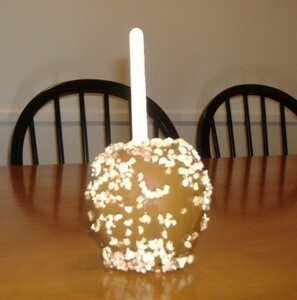 This realistic looking caramel apple is beautiful on display. You will have everyone thinking it's the real thing. Mix together Modge Podge and caramel color craft paint. Stir both and pour over foam apples. The nuts are made using cat litter, and, of course, I inserted a popsicle stick. Very fun, and so adorable sitting out on display.